The Digital Twin is a key enabling concept in business digitalization efforts. A Digital Twin is a digital representation of an asset. The asset may be a physical asset such as a sensor or vehicle or it may be a logical asset such as a business process or service. The Digital Twin can be used as a proxy for the asset making it convenient for integration into digital control systems and business analysis systems. 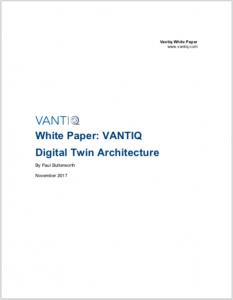 This document describes the VANTIQ Digital Twin Architecture, a pattern for rapidly building high fidelity Digital Twins on the VANTIQ platform.